Directions: You have 20 minutes to plan and write your response. Your response will be judged on the basis of the quality of your writing and on how well your response presents the points in the lecture and their relationship to the reading passage. Typically, an effective response will be 150 to 225 words. Summarize the points made in the lecture, being sure to explain how they respond to the specific concerns presented in the reading passage. The Salton Sea in California is actually a salty inland lake. The level of salt in the lake's water—what scientists call its salinity—has been increasing steadily for years because the lake's water is evaporating faster than it is being replaced by rainfall or rivers. If the trend continues, the lake's water will soon become so salty that the lake will be unable to support fish and bird populations. The lake would then become essentially a dead zone. Fortunately, there are several ways to reverse the trend that is threatening the lake's health. One option is direct removal of salt from the lake's water in special desalination facilities. Water from the lake would be pumped into the facilities and heated. This would cause the water to evaporate into steam, while salt and other materials dissolved in the water would be left behind. The steam would then be cooled down and returned to the lake as salt-free water. Gradually, the high salt levels would be reduced and the lake’s overall health would be restored. Another possible solution is to dilute the salt level in the lake with water from the ocean. Since water in the Pacific Ocean is 20 percent less salty than water in the lake, bringing ocean water into the lake would decrease the lake’s salinity. The ocean water could be delivered through pipelines or canals. Yet another solution would be to control the lake's salinity by constructing walls to divide the lake into several sections. In the smaller sections, salinity would be allowed to increase. However, in the main and largest section, salinity would be reduced and controlled by, among other things, directing all the freshwater from small rivers in the area to flow into that main section of the lake. It would be great if we could stop the lake salt level from increasing and save its fish and bird populations. But the solutions you just read about aren't realistic or practical. First, sure, taking salt out of the lake by desalination would reduce salinity, but it would present some serious problems as well. For example, as you've read, water pumped into desalination facilities evaporates and leaves behind solid materials that would dissolve in the water. Well, the solid materials that desalination facilities leave behind would pose a health risk. The materials will be mostly salt, but they would also include other types of chemicals. Some of the chemicals would be toxic, like selenium. If the wind spread selenium and other chemicals into the air and people breathe them in, that would be very dangerous to people's health. Second, the idea of bringing ocean water into the lake, again, this would reduce salinity. But as you've read, it would require constructing pipelines or canals. The problem is that the local government may not have enough resources to pay for such major construction. The nearest shoreline of the Pacific Ocean is 100 kilometers away. Pipelines and canals are very expensive to build over such long distances. As for the third solution, dividing the lake into sections by building a system of walls. Well, that's unlikely to work for very long. 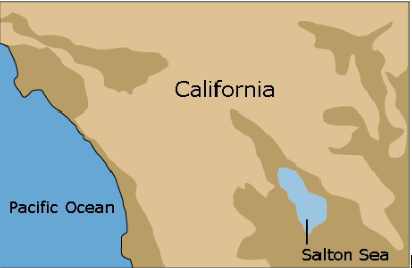 That's because the Salton Seas is located in a region that experiences frequent and sometimes intense geological activity, like earthquakes. That activity would almost certainly destroy the walls separating the different sections. So while this solution might work for a short while, the walls would likely collapse the first time there is a major earthquake. And water from the special sections with high salinity would mix back in with the low-salinity salinity from the main section.